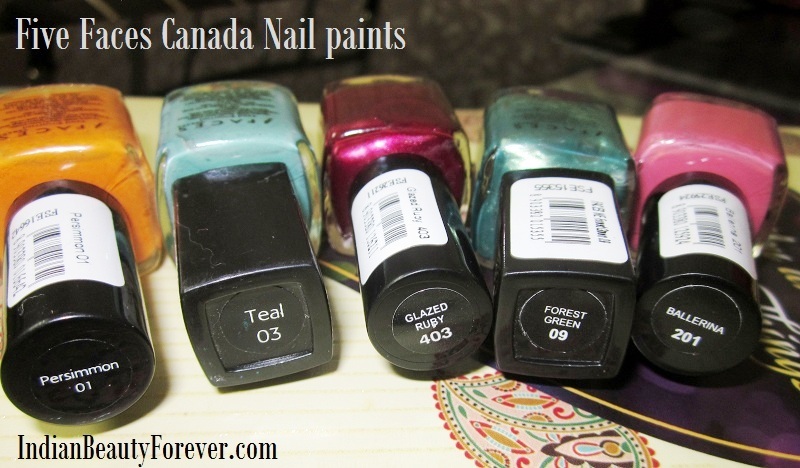 I just realized that I have reviewed five Faces Canada nail paints here. So, why not post all of the swatches in a single post! 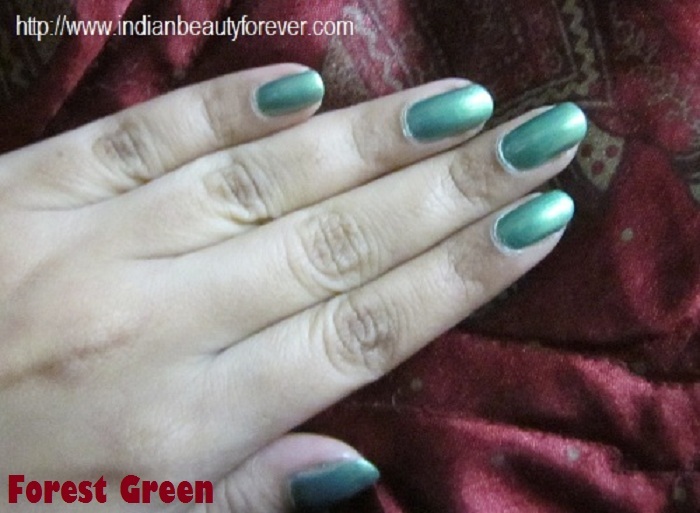 I love nail paints and if asked which is the brand I have tried and liked so far? Undoubtedly, I would say, Faces and Lotus herbals. They have similar price range and colors are drool worthy. 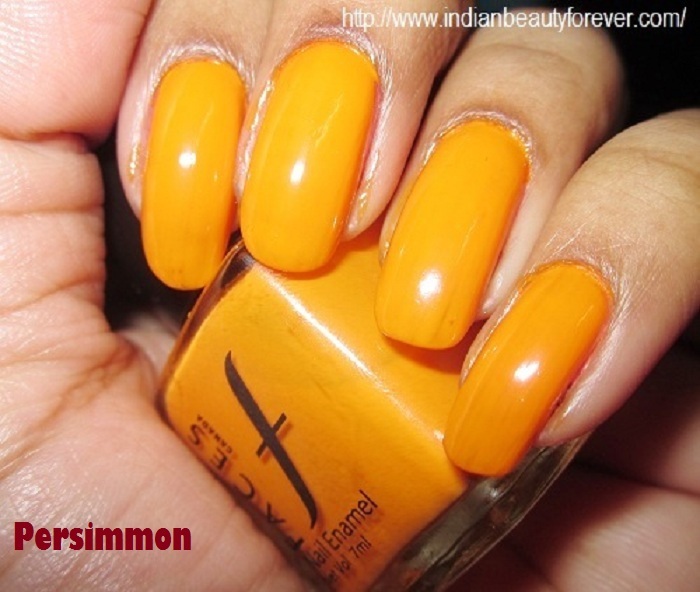 Persimmon- It’s a beautiful bright refreshing matte Orange color. Actually persimmon is the name of a fruit. It’s a color that you would love to flaunt during the spring summer season. This color also reminds me of oranges. So, if you are in your “loving oranges” phase then do give it a try! In fact every brand has one orange color as they are really in!! 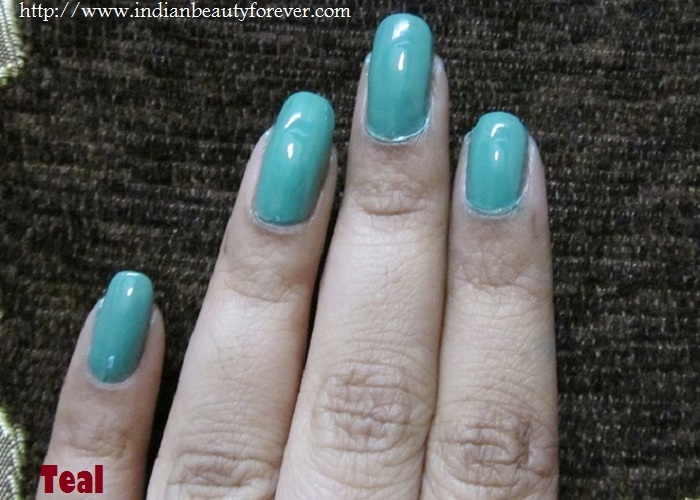 Teal- Just like its name, teal is a matte teal color which looks so gorgeous regardless of your skin tone. I think this color needs no season specifications as throughout the year this color can be sported and it looks lovely, this is what I feel. Those who are not into bright reds, oranges, pinks will love this color and texture is superb too! Forest Green- This Color is a limy green with gold shimmers, again a refreshing summery shade, subtle but pretty that makes it suitable for the office wear as well. 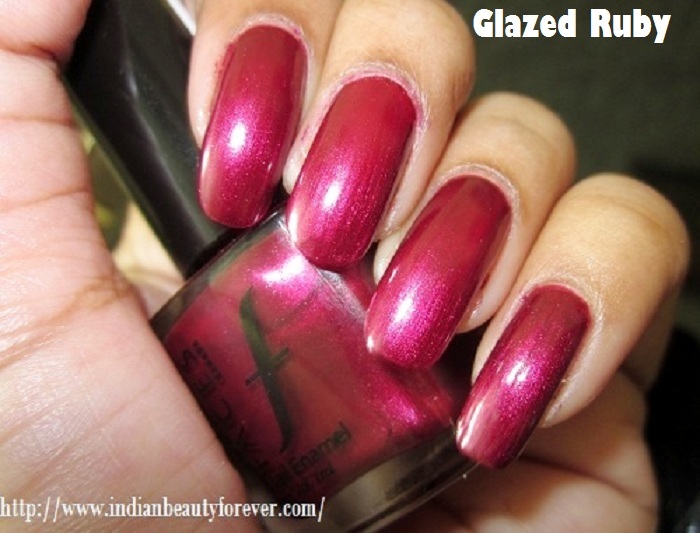 Glazed Ruby-Again, just like the name says, it’s a stunningly ruby shimmery color which always reminds me of satin cloth of the same color since the texture that you get once you apply this color is so smooth and shimmers, adds a sheen to it but nothing over the top or too chunky. Have a look at the pictures. It can be a great autumn and winter color and not to forget such colors, compliment extremely well with our traditional Indian Outfits. So, beautiful!! It is! I like all of them, but ballerina wins my heart the most. What’s your favorite out of these? I like ballerina too. It's a beautiful color ! Loving Ballerina on your hands.. Thanks dear! Ballerina is a lovely color! ballerina and glazed ruby are wonderful!!! Both are my favorite!! They look really good and has great finish. Persimmon and Ballerina are awesome!!.. I have the teal and love it... lovely swatches dear..
First of all, you have gorgeous nails! And thank you for the swatches. i loved the yellow and the pink the best! Thanks a lot Radha <3 But they are not long right. :P I waiting them to get lengthier again! Me too love nps a lot. All the shades are super pretty especially forest green! 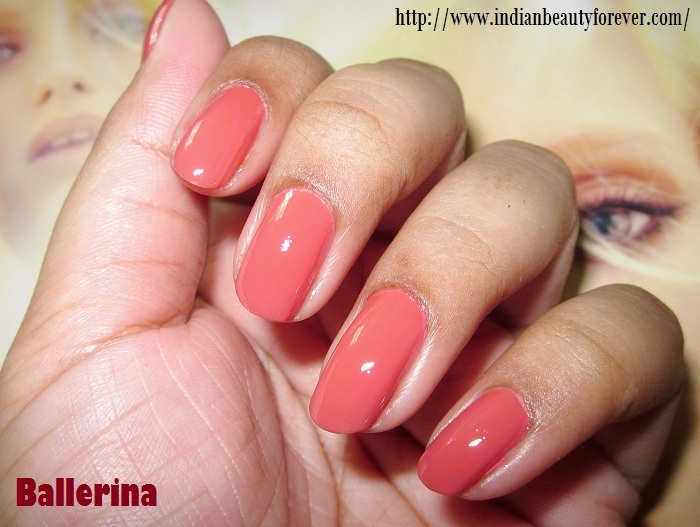 Love Persimmon and Ballerina! Lovely shades! i love the first shade its different and unique !!!!!!!!!! The Teal is Matte? Cool. I somehow always end up skipping the Faces counter at the Mall. Their counter always seem so scattered and disorganized and the salesgirls never grab my attention. After your review, it seems like I should take another look at them. Wow lovely shades... i liked the first & the ballerina. Nice shades, especially the shimmery ones! Gorgeous colors! Love "Ballerina"...so pretty! Your nails are so lovely as well! Ballerina is a pretty color! Absolutely would go for Ballerina! It's quite a peachy shade in your photo! I cant get enough of peaches and corals right now! Ballerina is really pretty! It's a Peachy color with some orange tones to it. same here, I love peaches and corals too!